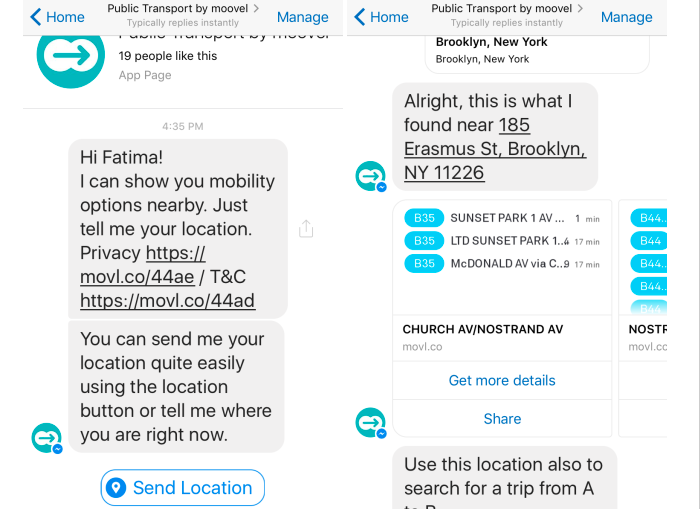 How To Get Public Transport Timings Inside Facebook Messenger : If you rely on public transport, and so many of us do, missing the bus or the train is the worst thing that can happen. It’s bad if you’re going for an interview and it’s bad if you’re trying to catch the last train home. For a daily work or school commute, most people know what time their public transport of choice arrives. Likewise they know their next option in case they miss the first one. For times when you’re caught unprepared, Moovel’s new Facebook Messenger bot Public Transport By Moovel is the answer. It works on both your phone and your desktop but is best used on phones. You send the bot your current location and it gives you public transport timings for it. Visit the link at the bottom to add the Public Transport by Moovel bot. Tap ‘Get Started’ and wait for the bot to send you its welcome message. Once you receive the messages, you will see a ‘Share location’ button. Tap it to share your current location. You will have the option to pick a different location via the in-app map and get transport timings for it.